Although much has been written about the peculiar institution of slavery, questions still remain about this manifestly cruel system. How could such brutality be tolerated by a modern, civilized society? Perhaps even more importantly, how could the victims cope with the numerous physical and spiritual challenges? 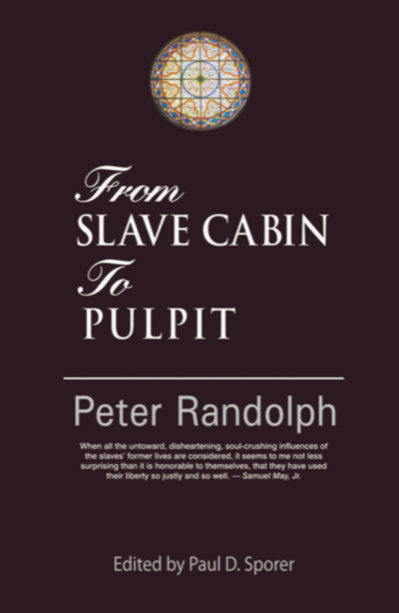 Out of print for over 100 years, From Slave Cabin to Pulpit shows the power of faith, of how one man, Peter Randolph, born into miserable poverty and ignorance, after an almost miraculous release from slavery, attained a position of respect and authority in white society. Reminiscent of Frederick Douglass' own narrative, this work provides a carefully written, detailed, and fair portrayal of life in slavery, and the life after it for those fortunate enough to have survived. An interesting historical facet — Randolph did not have to await the Emancipation Proclamation in order to achieve his freedom. He was freed after his owner's death through the stipulations of his Will. This book provides the entire text of the Will, and excerpts from related legal proceedings, which illustrate how this process functioned. Although the Will was contested, the final settlement definitively gave the slaves their coveted freedom. From Slave Cabin to Pulpit is a book full of hope and optimism, courage and forgiveness. By describing the workings of institutionalized, democratically sanctioned exploitation, Randolph hoped to assist the courageous people of future generations with their own struggle for justice. Now Available! To purchase this book from B&N, please click here.